Today I want to share with you the New Releases by Sizzix! Днес искам да ви представя новите продукти на Sizzix, които ще излязат през май! The latest collection from Tim Holtz celebrates friendship with words such as “wonderful”, “friend” and “smile” on Thinlits™ dies which are perfect for embellishing cards, gift wrap and tags and layouts. What’s more there is also a beautiful spiral flower along with designs on Frameworks™ which are great for layering on papercraft projects and more! Take a Tribal Adventure with this new collection from Craft Asylum®. With flowers and leaves featuring on Bigz™ dies the creative possibilities are endless. From cards, scrapbook layouts and gift wrapping to appliqué and home décor items, you can create it all! Our Bigz™ dies use our steel-rule technology to cut through anything from paper and cardstock to leather and denim! 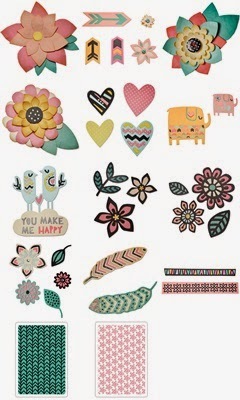 Also featured in this collection are florals, feathers, elephants and birds with intricate tribal patterns on Thinlits™ dies which give you even more creative reign on your makes. Not forgetting the two Textured Impressions™ Embossing folders with a fun and contemporary design to add dimension to your projects! Vintage Travel is the latest collection from Eileen Hull which celebrates those fond memories of family holidays. With layered florals, a stem and a strip of grass as well as a vintage caravan, this collection welcomes the summer holidays. Each design features on a Thinlits™ die making them perfect for layering on cards, gift bags and tags, scrapbook layouts, photo albums and much more! 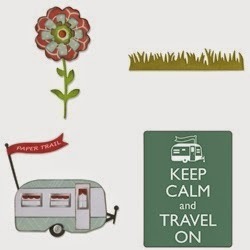 There’s even a Textured Impressions™ Embossing Folder with a fun quote ‘Keep calm and travel on’ to add more detail to your creations! За повече идеи можете да надникнете в блога на Sizzix . You can see more projects on the Sizzix blog.